We are making history in building a truly national, multiracial alliance to confront corporate and political power and put an end to criminalization, incarceration, and racist immigration laws. When Enlace launched the Prison Industry Divestment Campaign in 2011, we took aim at the punishment-based criminal and immigration systems that harm our communities. With powerful leadership from partners at Black and brown communities across the country, we came up with a plan to bring a united front against mass incarceration and immigrant detention to the doorsteps of the people caging our communities. We began building a diverse grassroots movement led by young people. We were unapologetically pro-Black, pro-immigrant, and pro-LGBTQ. We set out to win strategic victories against the profit-driven system of mass incarceration. All of this, we believed, would advance the movement to end our current systems of control and punishment. 7 years later, we can look back and say that we were right. Black-led student organizing at Columbia University pushed the school to be the first in the country to divest its endowment from CoreCivic and G4S in 2015. Uniting with organizers across the country from Families for Freedom, the Black Alliance for Just Immigration, the Florida Immigrant Coalition, Grassroots Leadership, Dream Defenders, and dozens of others, we shone a light on the atrocities of the prison system and the private companies, bankers, and politicians that were lining their pockets by locking people up. In 2008, we started following the money involved in the deportation pipeline. Looking into Arizona’s “Show Me Your Papers” law, SB 1070, we discovered the connections between the American Legislative Exchange Council (ALEC) and prison profiteer Corrections Corporation of America (CCA). We started to understand the powerful role that prison corporations play in pushing policy, infiltrating the criminal (in)justice system, and funding political candidates. We also studied the successful organizing of the Anti-Apartheid Movement of the 1980s in solidarity with the people of South Africa, which applied an effective divestment strategy in the United States even while Ronald Reagan was President. 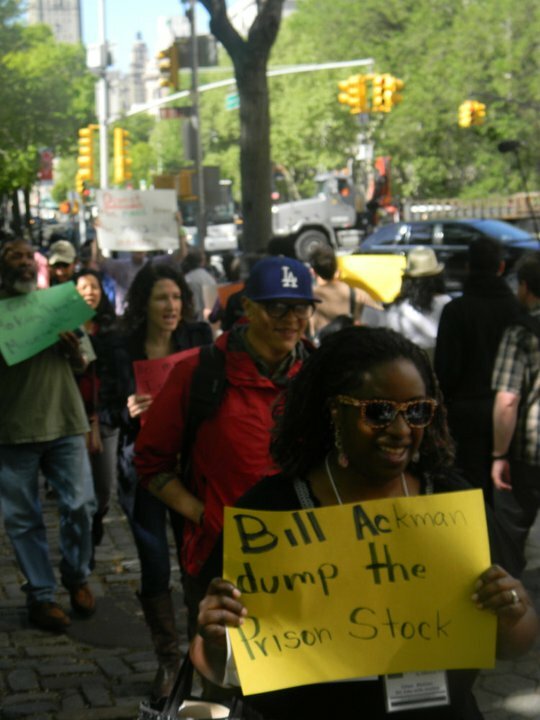 In 2011, we launched our campaign with a protest at the home of Bill Ackman, CEO of Pershing Square Capital Management. Enlace director Daniel Carrillo and Donald Anthonyson of Families for Freedom recall the shocked look on Ackman’s face as he realized the loved ones of people locked up in CCA jails were exposing him to his neighbors. Within the week, Pershing divested their prison stock, 7 million shares, and CCA stock dropped 10% in value overnight. Within a week of our Prison Industry Divest Campaign kick off action in 2011 we won a $180 million divestment by Pershing Square Capital Management. 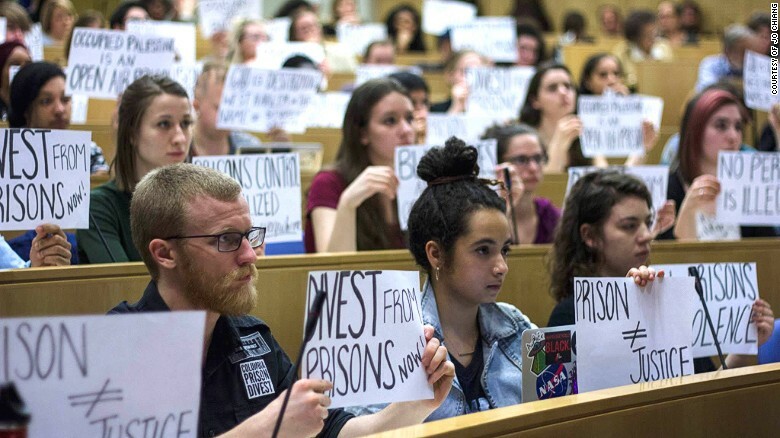 As the campaign took off, Prison Divestment became a place for deep political education. At our first Youth Retreat in Miami, FL in 2014 students taught each other about the history of the drug laws created in the 1970s that went on to ravage Black communities, and learned about how anti-apartheid organizers used divestment as a form of powerful international solidarity with liberation struggles in South Africa in the 1980s. They were building relationships across state lines, languages, and documentation status. 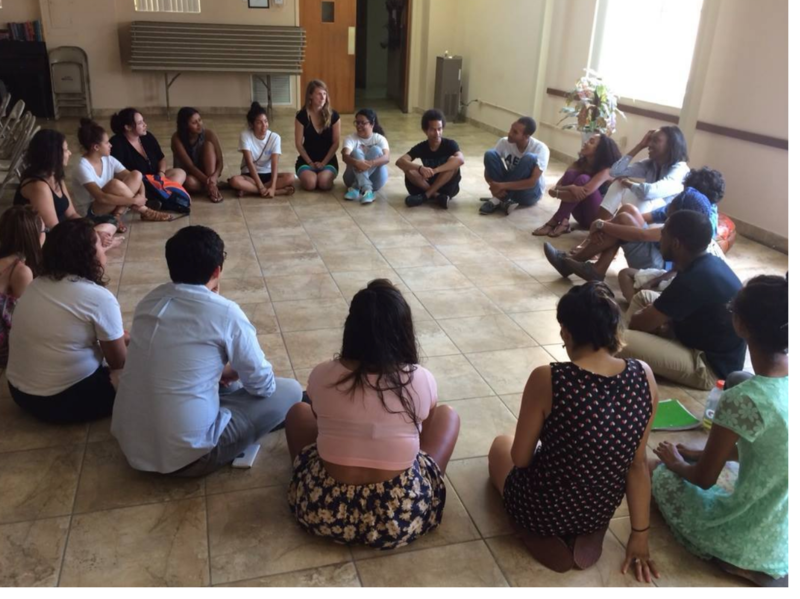 The first Prison Industry Divestment Youth Retreat in Miami in 2014 focused on building Black and brown unity. In 2015 and 2016, our victories started to snowball with divestment wins at Columbia University, the University of California, pension funds, and city resolutions. We held actions at the headquarters of GEO group and CCA, cataloguing and exposing the abuse and corruption happening within prisons around the country. 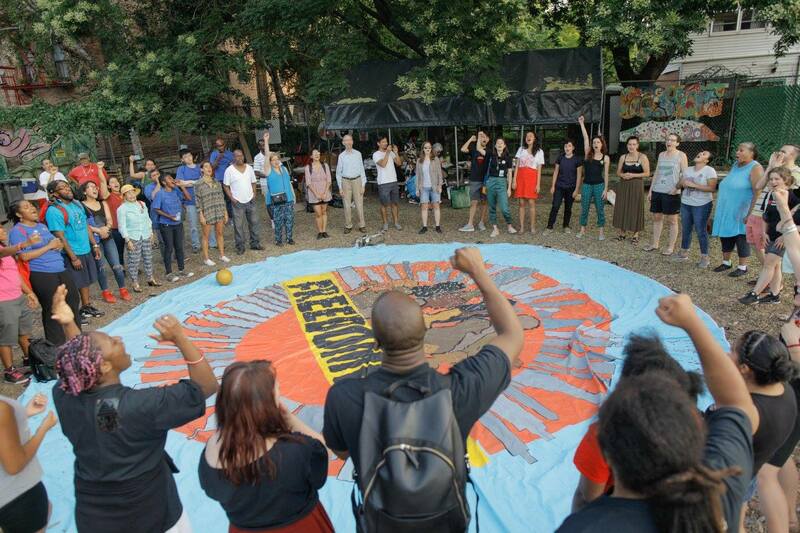 Columbia Prison Divest shown a spotlight on how the university’s investments in CoreCivic and G4S criminalized Black, brown and indigenous communities from Harlem, to the U.S., to occupied Palestine. In 2015, Prison Divest partners at the Afrikan Black Coalition successfully moved California State University – Los Angeles to divest from prisons and reinvest in Black scholars. Step by step we were not only winning victories against systems of control and punishment, but we reinvesting in people. We were starting to imagine what reparations and healing would look like, envision what our communities would need to fully thrive. And we were winning. 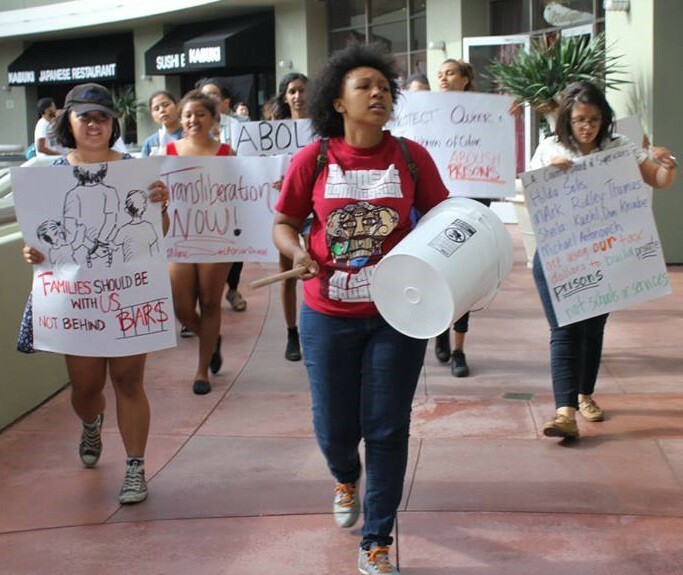 2015 youth retreat participants led a march to speak out at GEO Group’s regional headquarters in Los Angeles. In August 2016, the Department of Justice announced they would be cutting contracts with private prison companies. Two months later CCA changed its name to CoreCivic to distance itself from unrelenting exposure they’d been getting thanks to the incredible work of organizers with the campaign across the country. Then Trump was elected. The Department of Justice did a full about face on their commitment to cut contracts, and prison stocks skyrocketed as Trump and Attorney General appointee Jeff Sessions touted a “zero tolerance” policy for migrants, meaning more violence at the border, and more detention. 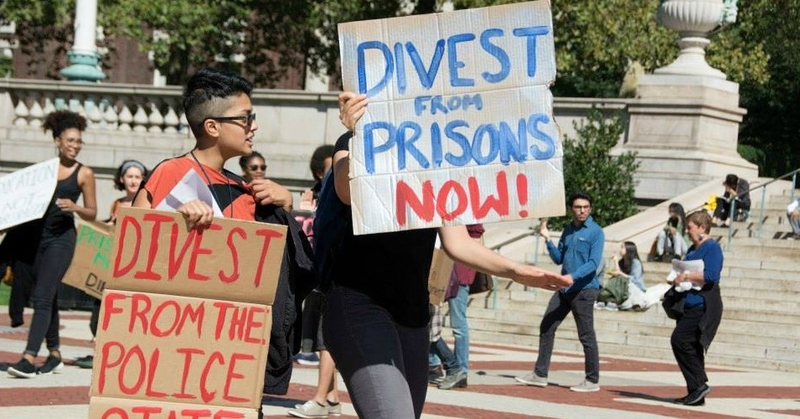 Portland is the first and only city to divest from prisons and all corporate securities–due to the organizing of a powerful coalition of prison divest, BDS, DefundDAPL and fossil fuel divest activists. 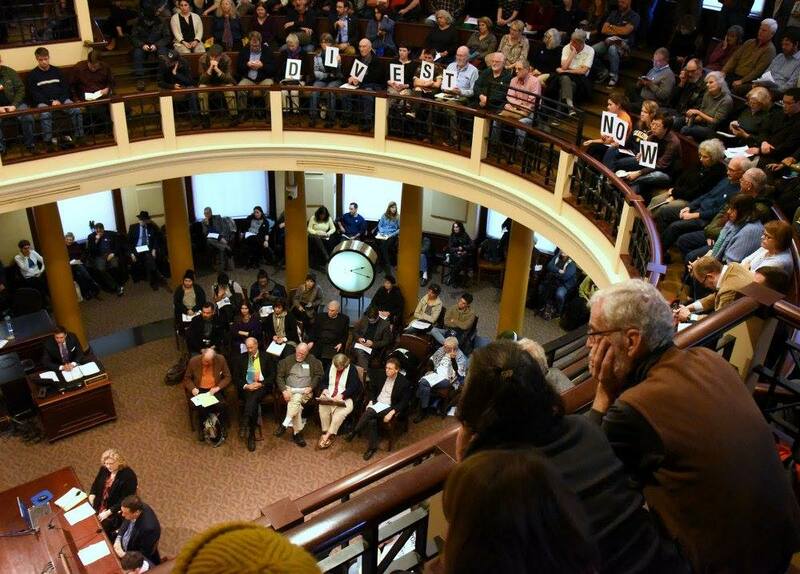 In spite of this – or in response to it – we saw more divestment victories than ever before. In 2017, the first cities divested from private prison backer Wells Fargo and the first anti-prison portfolio screen was created. Universities, Cities, Pensions, Endowments, and Faith Institutions moved a total of more than $4.2 billion dollars out of the prison system in just one year, more than all other years combined. Today, politicians are being pressured to donate or refuse campaign contributions from prison corporations. All of these victories create more opportunities for divestment from prisons, policing, and criminalization, and the halting of prison contracts and construction. In just 6 years, Enlace and our partners have increasingly made profiting from pain a toxic liability in the world of investment and mainstream politics. Today’s attention on family detention has reaffirmed our divestment strategy, as we work with larger organizations to pile on the corporate and finance industry targets that Enlace identified early on. Dozens of groups, including the Center for Popular Democracy, Make the Road, the National Domestic Workers Alliance, and Color of Change have now launched their own campaigns, adding to powerful momentum. See here for a full list of Prison Industry Divestment Campaign Victories to date. However, with an administration so blatantly pushing forward racist policies meant to cage our families, we knew it was time to broaden our strategy. Freedom Cities is how we are putting that vision into action. In 2017, Enlace led a group of worker centers and grassroots groups to launch Freedom Cities, a movement to push for investments in our communities–not in policing, prisons, and detention–to make our communities safe for everybody. Shortly after, the Black Alliance for Just Immigration, Ella Baker Center for Human Rights, and Million Hoodies Movement for Justice joined us as a national leadership body. Redefining safety and building Freedom Cities at Night Out for Safety & Liberation in the Bronx in 2017. Divesting from prisons and reinvesting in community is one strategy of a broad movement network that we are co-creating through Freedom Cities. On our anniversary, we look back at 20 full and vibrant years of campaigning to decriminalize and liberate our communities. We are grateful for the thousands of people and organizations that have shared strategy sessions, direct actions, healing justice convenings with us. We are grateful for the activists, the facilitators, the organizers, the movement-builders, and the donors and funders who put their resources on the table for liberation. We invite you to join us October 18th in Portland, and November 15th in New York City at our Resist Together 20th Anniversary Celebrations. Reserve your ticket today, and join us in welcoming in the next 20 years. Thanks to all of you, our movement is strong. We believe that people will choose freedom, and it’s up to all of us to keep leading the way.